Cabarruyan Island, Pangasinan Region, Philippines. Anda is the name of a town on Cabarruyan Island, Pangasinan, Philippines. Beyer gave the name Anda-type sculpture to an unusual v-shaped sculpture that resembles rat chew marks. This is the classic type area, but Anda-type sculpture can occur in all types of tektites (e.g. Philippinites, Indochinites, Australites, Bediasites and Moldavites). It just requires the correct conditions which are likely a more alkaline environment. Not all tektites from Anda are Anda-type. 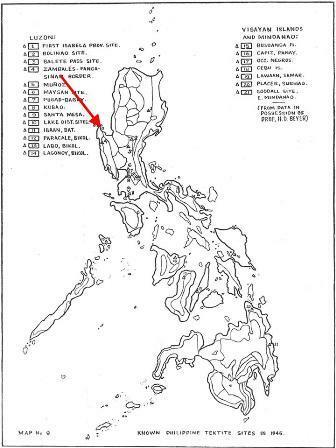 ABOVE: A map of the Philippines taken from Beyer, H. O. 1962. Anda is a town on the island of Cabarruyan, Pangasinan Region, Philippines. It is famed for it's moldavite-like Philippinites or 'Anda' sculpture. ABOVE: Cabarruyan Island, Pangasinan Region, Philippines. The green dots highlight find localities from one trip. Tektites can be found in most areas of the island. ABOVE: Zooming in on Cabarruyan Island, Pangasinan Region, Philippines. The green dots highlight find localities from one trip. 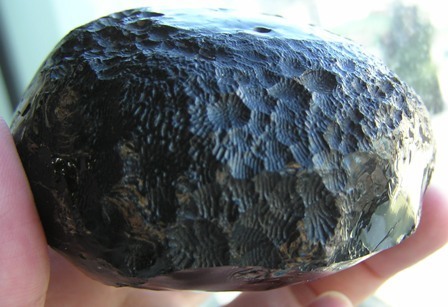 Tektites can be found in most areas of the island, however, they may be concentrated in river channels. These are utilised for farming rice. In this area, I believe there is only a single rice crop each year. To optimise your trip you should time it for when farmers are not too busy with their rice crop, as this will take priority over selling tektites. ABOVE: Cabarruyan Island, Pangasinan Region, Philippines taken from a commercial airliner. ABOVE: A typical countryside scene in Cabarruyan Island, Pangasinan Region, Philippines. ABOVE: Checking out a small rock exposure. No tektites found here, but they have been found close by. Cabarruyan Island, Pangasinan Region, Philippines. ABOVE: These are tektite-bearing gravels from another locality. ABOVE: One can find tektites on Cabarruyan Island, but if you want the best then you need to ask around and buy from locals. If you see a gathering just stop and have a chat. The sculpture is associated with an alkaline environment that attacks the silica network. It most commonly occurs on primary (posterior) surfaces and around bubbles. Like all chemical attack it attacks pre-exisiting weaknesses. The sculpture often radiates towards the central cooling point of the tektite. ABOVE: This is what we've come to Anda for! The prices of good pieces can get quite high though! Be prepared to negotiate and sometimes you'll have to leave it. ABOVE: This is amongst the best you'll find. Getting a piece like this makes the whole trip worthwhile. ABOVE: A dumbbell from the Anda region, showing excellent Anda sculpture. ABOVE: Typical U-grooved Philippinites are also found in the Anda area, Pangasinan Region. Not all Anda tektites have Anda-type sculpture. ABOVE: Well developed sculpture on this tektite from the Anda region. 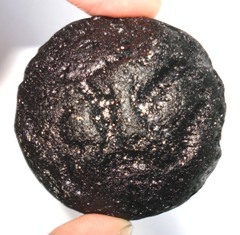 ABOVE: An Anda tektite from Anda Town itself! This specimen was found about 5-6ft below the surface as foundations for a house were being dug. 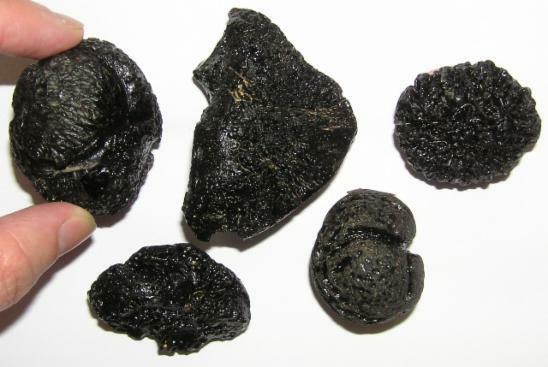 ABOVE: Tektites found close to, or on Cabarruyan Island. Bought from the mainland, directly opposite Cabarruyan Island. I suspect these have been found on the beach as some are water worn, but I could be wrong. These are lower quality. ABOVE: Not all Anda tektites are Anda-type. These are much lower grade and this is reflected in price. 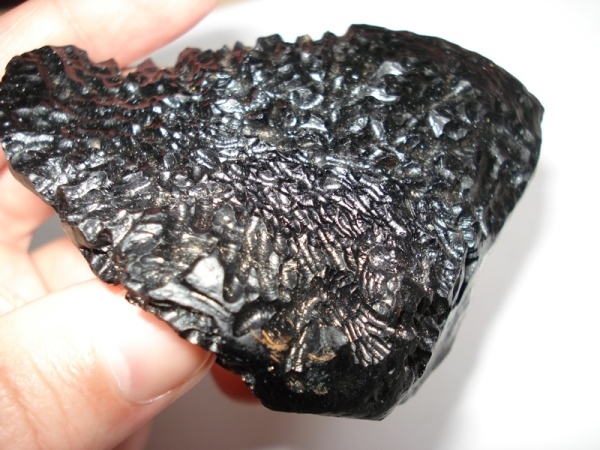 ABOVE: This isn't my specimen but a photo of a photo of a reportedly 1 kilo Anda-type tektite from Cabarruyan Island. ABOVE: Here's a high quality piece that I obtained. ABOVE: This specimen is a beauty! I even managed to collect the soil from where the specimen was found whilst the farmer was planting vegetables. So what else is near Anda. Well of course you have beach resorts on Cabarruyan Island and in nearby Bolinao. You have the tourist attraction 100 Islands nearby. But what else might you find there? LEFT: They might look like Elephants but they're not! In the centre of Anda town you'll find this statue of Stegadon. On Cabarruyan Island extinct mega-fauna like Stegadon have been found. Watch this space: It was concluded that a Rhino found in Kalinga (about 200 km away as the crow flies) was slaughtered by early hominids 709,000 years ago. I'm sure this area is going to have a second look. In 2018 Ingicco et al. found a Rhinoceras skeleton in Kalinga. The bones had scrape marks. Associated stone tools and a tektite were found. The Rhinocerass dated to 709,000 years ago. At the time of writing (2018) these finds are exhibited in the National Museum of the Philippines. ABOVE: Whilst much more recent, I was offered this stone axe / adze. I'm not sure on the age, but possibly thousands of years? ABOVE: I also got this small bronze cannon ball. I believe this is from Spanish times (possibly the Spanish-American War). They used bronze as it didn't rust whilst at sea. ABOVE: These curious things are actually fossilised Tetraodontidae (Puffer Fish) teeth. ABOVE: On Cabarruyan Island and nearby Alaminos area you can find Megalodon teeth. This was a huge and now extinct shark that ate whales! ABOVE: Finally here's a curious piece of glass. When I bought it (and to this day) I am almost certain that it is slag glass. I would like to test this though to be 110% certain.